Parents are such sources of wisdom. Even if they’re fuzzy on the mechanics of things, they know the outcome. I guess, most of the time, that’s enough to help a kid grow up without slicing their hands open, putting a crater in their cranium, or in my case, scorching off my entire palate. For that, in particular, I am so grateful. I figured this out, not too long ago, and was very intrigued. I’m actually so excited to share this with you. Nerdy, whatever. So let’s start with the basics. Water, that is, pure H2O, cannot stay in liquid form beyond 100 degrees C. Now, add anything, and since we’re in the kitchen, make that anything be salt or sugar. Now that boiling point temperature becomes higher. In other words, a pot of boiling salted water is hotter than a pot of boiling pure water. Not cool, I know. Caught that? Good. Let’s keep rolling. So what do you care? Well, that higher temperature is what makes your pasta taste better, as in with a bite that has a bit more bounce. In fact, the higher temperature results in a more quickly denatured (cooked) gluten (protein), which gives it a more resilient chew. On the other hand, you don’t want this to happen to your meat if you’re simmering or blanching it, the extra pinch of salt will make it tough, same principles. What about sugar, though? Exactly the same. So, coating your carrots with honey, makes them cook more thoroughly, and results in a sensuously tender, rich, and sweet interior. This you cannot achieve by boiling, which adds water to the flesh, making it mushy, not by simply roasting, which takes forever and leaves them dry and chewy (or worse, with an uncooked center). Yeah, so the 101 of this whole post: honey, squeeze that bottle. These carrots are basically candied, and would go well with cool, slightly acidic cheeses like labne, quark, or fromage blanc. Of course, an addition of some crunchy bits like toasted baguette slices, toasted pistachios and some coarse salt and black pepper would make these irresistible. Serve these as part of an appetizer or, equally fitting, a cheese or even dessert course. Just be careful, the carrots will literally burn off the insides of your mouth if you eat them straight out of the oven, and even five minutes after. Experience and my mother’s words of wisdom have taught me restraint when it comes to these. 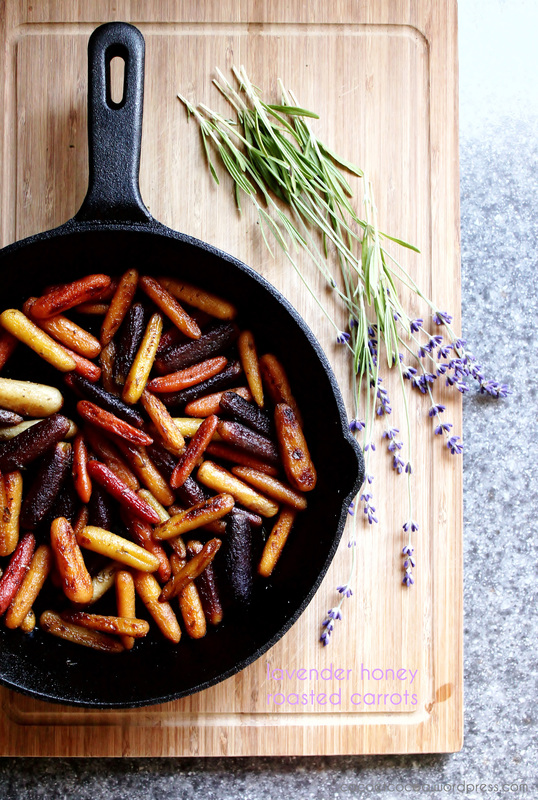 To make the roasted carrots, preheat the oven to 450 degrees F, with the rack in the middle of the oven. Toss all ingredients, except for the honey in an ovenproof dish until combined. Roast for 20 minutes, or until starting to brown. Add one third of the honey and continue roasting until the mixtures appear dry. Repeat until carrots are tender and well caramelized. How much honey??? 1/3 to 1/2 of what?? Sorry, of a cup, thanks for letting me know!